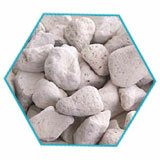 Americos supplies of all types and grades of pumice stone. For textile general grade are 1-3 cm, 2-4 cm, 3-5 cm and 5-7 cm. It is pure white and leaves very little waste when used, compared to those of other stones, thus making sabay Pumice recognized and demanded by the end users in many markets of the world. There are three types of pumice products, which Americos supplies. The first is the micronised pumice powder, from 0 to 160 microns. The second is the pumicite (mainly for construction and horticulture purposes) from 3-8 mm to 15-20 mm. The third is the textile graded as 1-3 cm, 2-4 cm, 3-5 cm and 5-7 cm.